Casa nella Selva is a three-story stone farmhouse a half hour north of Lucca, in the Serchio River Valley. 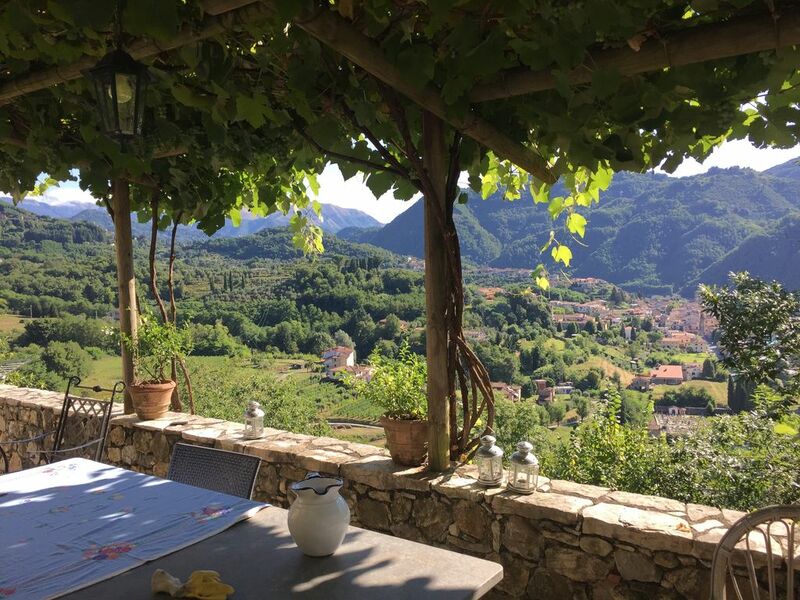 The house overlooks the town of Borgo a Mozzano, with a panoramic view of vineyard-covered hillsides, clusters of farmhouses and the spectacular Appenine and Apuan Mountains in the distance. A plant-lined terrace runs the length of the house, with a large stone table for outdoor dining shaded by a rose and grape-leaf pergola. There's also a vine-covered stone shade room for sitting outdoors at midday. There is a large outdoor pizza oven for ambitious cooks, an inexhaustible supply of rosemary, basil, and sage from spring through the end of October. There are several small flower gardens on the property, a second small terrace for quiet reading and a hammock in the woods for afternoon naps. A working chestnut farm into the late 1980s, the house still has its original chestnut beams, and is simply and comfortably furnished with a mix of country pieces, including many that are original to the house. There are terracotta floors, original or restored, throughout, beautiful wooden windows and shutters, proper reading lamps in all the bedrooms, lots of leftover books to read. The ground floor includes a fully-equipped kitchen with fireplace, a dining/sitting room that opens directly onto the terrace, a modern-tiled bathroom with large glass stall shower and a washing machine. The third floor, formerly the hayloft, has been converted into an open living space, with a large table for sketching or board games, comfortable reading chairs, a double bed and a day bed/sofa. Its floor-to-ceiling windows share the same view as the terrace. The comune of Borgo is the major town between Lucca and the Garfagnana, one of Italy’s most beautiful and popular trekking zones, and is easily reached by car or public transportation (regular trains and buses from Lucca). Borgo’s population is about 8000, of which roughly half live in town, the remainder in small villages or 'frazione' nearby. In addition to a supermarket, the town has an abundance of excellent food shops; you can find fresh bread and homemade pasta, extraordinary local pecorino cheeses, wonderful fruits and vegetables, wines from the Lucchese hills and just about everywhere else. There is an outdoor market on Friday mornings, and similar ones can be found nearby on Tuesdays, Wednesdays and Saturdays. There is also a large number of modestly-priced restaurants serving excellent regional dishes within a twenty-minute range, and one very good one in town that is open for dinner six days a week, and for lunch and dinner on the weekend. The Lucca region is one of the last parts of Tuscany to be discovered by tourists, and is anchored by two especially beautiful cities: Lucca itself, enclosed within its perfectly preserved wall, and Barga, whose narrow winding streets lined with ochre, persimmon, or apricot colored houses lead to a spectacular 12th century cathedral of white stone that looks out over the Apuan Alps. In between is in the spa town of Bagni di Lucca, 15 minutes from Borgo. Borgo itself has two clay tennis courts, and a beautiful community recreation center with a 25-meter swimming pool, a separate pool for toddlers, snack bar, and rentable lounge chairs for sunbathing. The beaches of Viareggio and Forte dei Marmi are within an hour's drive; the towns of Carrara, Pietrasanta, the Cinque Terre and the spas of Montecatini are all easy day trips. One of the great advantages of the house is its easy access to Lucca, Pisa and Florence. It is possible to spend the day sightseeing, museum-going, and shopping, yet be home in time to enjoy dinner on the terrace. Features include fireplace, telephone, high speed internet and wireless, washing machine, dishwasher, outdoor oven, and barbecue. Activities nearby include the beaches of Viareggio, Forte di Marmi, Tirrenia and Cinque Terre, antiquing, garden and villa tours, hiking, and trekking. For shoppers, there are fabulous markets almost every ay of the week: Sunday and Wednesday mornings in Forte di Marmi for high end clothing, leather goods, and cashmere; Wednesday and Saturday in Lucca, for household goods, inexpensive clothing, bags, shoes, and local farm produce. Smaller markets are held in Borgo itself (Friday), and Bagni di Lucca (Wednesday and Saturday). I'm a writer who lives in Brooklyn, and the author of Chronicle Book's Rome Walks and Village Walks Tuscany. I bought the property while visiting friends because it was the nearest abandoned house and I wanted to do what they had done—bring a house back to life. I was a youngish widow, with an eight-year-old daughter. I hadn't the least idea how I would make it happen, but I wanted to be able to return regularly to Italy and this seemed like the best way. What we and our visitors love about the house is its simplicity and authenticity, its spectacular view, and its connection to the past. It offers the intimacy of real Italy, with a minimum of modern distractions, and entree to a genuine and unfussy Tuscan town and way of life. By design, there is no TV, but there are plenty of books, pots, pans and fresh herbs to cook with, and a large stone table to sit around late into the night. First floor bath is tiled in white with cerulean blue and green accents; includes large stall shower, toilet, pedestal sink and washing machine. Second floor bath is finished in marble tile, with a large comfortable bathtub, separate tiled stall shower, double sinks, toilet and bidet. Borgo a Mozzano, now a town of some 10,000, appears in the written record for the first time in 879. It lies midway between the city of Lucca and the Garfagnana, one of Italy's hiking areas. The house has a panoramic view of the Serchio Valley and the Alpi Apuane and Apennine mountains. Beautiful former hayloft that overlooks the valley, furnished with comfortable couch, easy chairs, tables for game and dining. Has freezer and ice trays. Five gas burners for stove top cooking. Electric oven in kitchen plus outdoor stone oven. Traditional espresso makers, small and large. Tenants buy their own groceries, but there is usually a large sampling of oils, vinegars, salt, pepper, flour on hand. Abundant: plates and soup or pasta plates, dessert plates, cutlery for 12. Also multiple serving bowls and baskets. Traditional but renovated, with a beautiful stone sink, dishwasher, recessed refrigerator, and marble top counter and work table. Three large dining tables, two indoors, on first and third floors, one outdoor. Stone terrace runs the length of the house, partially covered by grape/rose pergola. Second smaller side terrace in the shade. In town, really lovely, and clean, like an old fashioned American country club. We rented this house from Martha for a week-long family trip in the summer. We have 3 boys (15, 13, and 11) and intentionally stayed away from the major tourist attractions. Our intent was to experience an authentic Tuscany getaway, and Martha's house proved to be the perfect launching point for our adventure. The house is incredibly authentic and spacious enough for our family of five. The views are outstanding and Martha's guidance and suggestions were thorough. We spent most days making trips to the surrounding villages, where we consumed gelato, hiked, and swam. Each night was filled with plenty of wine and incredible local food back at the house. As some have mentioned ,the drive to the house is a bit tricky, but well worth the effort. The traffic noise from the valley below was louder than we anticipated, but it didn't detract from the breath-taking views and the fact that you were taking in a quintessential Tuscany vacation. Highly recommend working with Martha to make your Italian getaway a reality. Hi, my name is Iris and I am 12 years old. I loved the villa down to the last decoration. The home was amazing. One of my favorite things about it was the view. The villa was conveniently located making it easy to take day trips out of the small train station in the town. Hi, my name is Ella and I am 14 years old. The view from this breathtaking house was unreal. Waking up and seeing the picturesque little town Borgo A Mozzano was a once in a lifetime experience. I wish I could go back! My name is Clayton and I'm 17. I cannot emphasize enough how beautiful the view was. This house was a nice break from the touristy metropolitan areas. You are essentially perched up on the side of a mountain so you feel totally secluded, but it is only a 10 min. walk down the mountain to the train station. The home felt rustic and authentic, but had every modern appliance you would need. One of my favorite nights was when we baked our own pizzas in the woodfire oven next to the house! And on our last night we had a four-course meal at the Osteria I Macelli, a 15 min. walk into town. And we are Lisa and Peter, the parents, and we could not have expressed our love for this hidden gem better than our three children! What a wonderful review. Thank you, all five Markhams. You are part of a long line of backpacking visitors to Monte, and you may have broken the record for adventures on foot with your trek to the Festival di Birra. Also for making friends with neighbors. Do come back sometime. The path to town will still be here, and the view. Martha's house is a piece of paradise. Borgo a Mozzano is the perfect place to sit, admire, breathe and do nothing or hop in the car and go to all the small towns around that offer village fairs, music festivals, from the kitch to the fabulous. Don't limit yourself to Lucca (25 minutes easy drive) or Florence (60 minutes cheap train ride from Lucca). Explore! The house itself is amazing. Confortable, clean, every piece of it was renovated in the most perfect taste. And that view! You are all alone in the middle of that hill. But a 5 minutes walk down it will take you to the village swimming pool and community centre where, if you are lucky, you will find beautiful music, like we did, or simply swim while admiring the mountains all around. Paradise is definitely in Garfagnana! Lina, thank you for the lovely review. It's always a pleasure to have such well informed, enthusiastic and adventurous guests. Hope there's a third stay in the future. Aaaaaah, Borgo a Mazzano. What a lovely town, rich in it's simplicity. We were SO glad to have chosen to stay in this small town where locals truly LIVE, rather than a touristy metro area. One would be hard pressed to stay in a fast-paced frame of mind here (unless you're driving ...that's a very different story!). The first morning, we older folk awoke to a full brunch of local meats, cheeses, fruits, and breads from the town shops; bounty from the kids' earlier walk down the hill. We enjoyed our first cups of Italian coffee a'la the stovetop moka pot, with added local honey, while overlooking the breathtaking view. It was HEAVEN! Later in the vacation, we went wine tasting and let me just say that the view from the villa was even more gorgeous than any vineyard we photographed. We had a photo enlarged for a large wall at home. There was rain, so I would like to spend a summer or maybe a spring there someday to get that experience. Until then, Gracie Mille!!!! What a terrific account—thank you for posting. I'm delighted you had such a good time, and yes please do come back. We enjoyed meandering down the trail from the house into town and hopping the train to Lucca. Lucca is a fabulous city...so much fun and so much to explore and eat! The highlights for us were cooking with Chef Paolo Monti and the walking tour with Wanda...both were sensational. We also enjoyed numerous hikes in those gorgeous mountains...the vistas were breathtaking and the wild flowers were at their peak. Rarely did we encounter anyone when hiking the trails and we were always rewarded with a serenade from the cuckoo bird! We loved everything about your charming house. There was plenty of room for six adults spending a month together. The kitchen suited us perfectly, and allowed us to prepare many delicious meals from local ingredients. We loved the beautiful old bowls and fine linens. It was so much fun making pizza in the outdoor oven...we never tired of dining on the terrace. And oh, the roses...everywhere, beautiful and scented. Thank you for keeping your farmhouse a home! Thanks very much for the review and the feeling is mutual. It's a great pleasure to have such terrific people living in the house and feeling so at home. You were ideal tenants and I hope you all come back some day. All best and thanks again. Martha's home above Borgo is truly one of the loveliest we've ever stayed in. Beautifully restored, exceptionally comfortable, fabulous gardens and a view not to be believed. The kitchen is fully stocked -- you can actually make excellent multi-course meals (at least we did! ), the beds are excellent and the dining area is charming. The road up is dicey, but quickly becomes second nature, and the walk down (which we preferred) is doable even for aging boomers (2 out of the four of us). Borgo itself has several good eateries (the little pizza place in town is great) and it's really easy into Lucca (try Rest. Giglio -- fantastic). We are well travelled folks, and recommend this house unreservedly. Swimming (beach and pool)—not on property, but easily accessible. Pool is in town, Mediterranean beach is an hour's drive, Cinque Terre, 1 1/2 hour.